Having just completed our SOS Online Backup Review work for the re-vamped home edition and finding the elusive SOS Online Backup Free Trial link it seemed time to update this review page. SOS Online has been in business for a long time and created a highly respected brand in the area of business online backup offered primarily through local partners. Now, though, the SOS Online Backup Home Edition is quite polished; it’s been updated with new features such that it really is a contender for your trust and business. The service is a little bit more expensive, though in feature comparisons they offer most of what anyone else does with a key feature that pretty much no one else offers. One key feature they seem to be kind of stingy with is their free trial. Not that they don’t have one, they do. While one of the shorter time periods – 14 days – and limited to 50GB (which shouldn’t be a problem for a 14 day free trial), they make it hard to find the link to get started. It’s not on the home page or available when you click the big green “Backup Now” button, but it is available from the menu. Rather than keep you in suspense, if you want to start an SOS Online Backup Free Trial for Home users, click here! 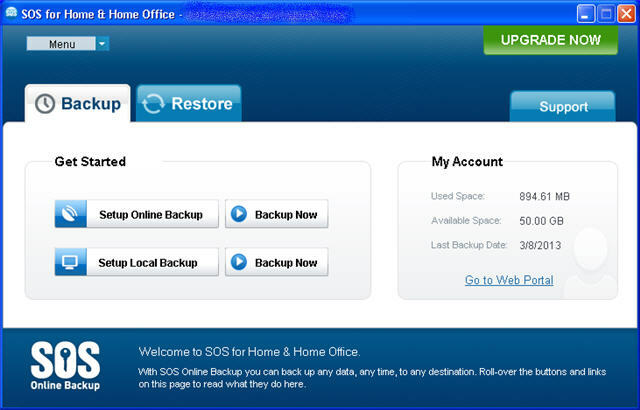 Who Is SOS Online Backup Home Right For? Since these descriptors are just a guide, don’t think you have to check off all of them to describe your need for a cloud backup service to think that SOS backup is right for you. Keep reading for more details on what they offer and how it benefits you. Continuous Data Protection: Yes, but online on a file level, not folder. Need to turn on manually. So as you can see, most every option a person wants is covered, with the possible exception of media streaming and Linux support. SOS cloud backup does compare VERY favorably to most of the other big names on online cloud backup services, especially the heavily advertised ones. SOS Home Backup Is FAST! On SOS’s website they have comparison times for backing up a large amount of data and show how much faster they are than Mozy Home or Carbonite, which are both pretty fast in their own right. Naturally, your mileage may vary, but when we did our testing, in the middle of the day (on a Friday) when we were using our internet connection heavily and most other people and companies are also, we were quite impressed by how fast a large directory of 1MB+ photos were uploaded to their cloud storage. One of the first things we did while the initial backup was still running was to download the SOS Online Backup mobile app from Google Play and try it out. So, again, there is no media streaming, but you can quickly download a file by tapping “My Cloud”, navigate and select the file(s) to download and then open or play it via the “My Downloads” button. Once we logged in to our account in the app, subsequent accesses did NOT require us to re-login; which is primarily good since we have a rather long email address used as the user id and long, complex password – and we recommend you do the same on your password. Naturally, for testing, we started out with the SOS Online Backup Home Free Trial. Once we signed up with our email address and password (no credit card required), we were taken to a web page with Windows and Mac software to download. The download was quick, about 20MB. Note that Microsoft .NET 3.5 is required (for Windows machines) and was already installed on this computer. Once installed and login credentials entered we were taken to the backup wizard. The SOS backup wizard is pretty nice in that it shows you what it will backup but allows for you to easily examine and add additional files that may be in other, unexpected locations on your drive. You have the option to let it scan or manually add file selections. We added a network share (without mapping it) to a Netgear ReadyNAS Ultra2Plus and selected a directory of lots of photos. We setup a time to schedule automatic backups and left the check box selected to begin a backup when done. 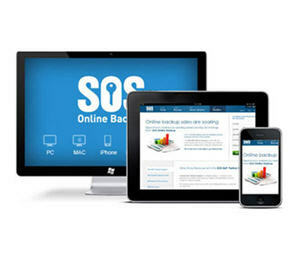 The SOS Online Backup Home software was painless to install, quick to configure – even with some custom options – and very fast to complete the first backup with about a gigabyte of data. Support for SOS backup seems to be pretty good so far. I did have some trouble with the knowledgebase locating an article on continuous data protection, which was obviously there since I was referred to it by a support person in a chat session, but many questions are answered. When I couldn’t find an answer, chat (during business hours) was quick to connect to a person, and an accurate answer – in the form of a link to instructions – was quick and painless. SOS Online Backup Home and Home Office is an excellent choice and receives as high of rating as we have given any online backup service. We rate it just under IDrive (read our IDrive Review here) primarily because of the price being higher. Unfortunately neither of these cloud backup services is as well known as they should be. Both seem to spend more time developing and solidifying their cloud backup infrastructure than they do on marketing. In fact, like IDrive, SOS Online has a business version as well, with advanced server features. Fortunately, they now have this full featured home and home office version with all of the relevant features, performance and reliability. So if SOS looks like a good fit, then you can subscribe now or try the 14 day free trial (No credit card required for free trial – [glad those days are gone! ]).